Collect Summer Reading Beads and Prizes through August 28th! 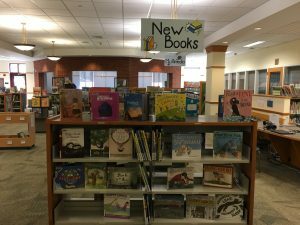 Welcome to the Goodnow Library Children’s Department! The child ren’s room is a welcoming environment for kids and families to learn and play together. Come by to meet your Children’s Librarians, attend a program, check out our collection of books, audio books, ebooks, music, movies, magazines, databases and more. We’re a place where you can meet your friends and new faces, share ideas and experiences, and just hang out. Stay up-to-date with the Goodnow Library by joining our mailing list and never miss out on a program again! Sign up for “General Information” for the weekly newsletter and information about all library events, and sign up for the “Children’s Library General Information” to stay updated on specific children’s room events! If you have any questions about our collection, events, or simply what to read next, let us know. Contact us by phone (978-440-5540), via email or by stopping by the Children’s Desk. We’re always here to help! Thanks for stopping by. We’ll see you soon!